Do consumers care about ethics in fashion? Do consumers really care about ethics in fashion? Food companies are always keen to trumpet their ethical credentials - why doesn't the apparel industry follow suit? 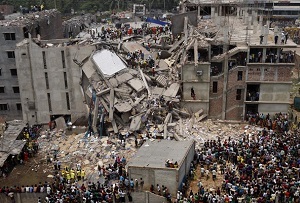 This Sunday it will have been three years since the deadly collapse of Rana Plaza, the Bangladeshi complex of garment factories whose customers included Primark, Benetton and Matalan. The disaster killed 1,134 people, making it the deadliest accidental building collapse in history, and sparked a global debate about labour conditions in the fashion supply chain. To be fair to Primark, it was among the top performers in the ‘Fashion Transparency Index’, an analysis of companies’ commitment to cleaning up their supply chains, which was published this week to mark the anniversary of the disaster. Of the 40 major fashion companies it looked at, 40% don’t have a system in place to monitor and improve labour standards at a board level (Primark is one that does). Only 11 ‘show evidence of working with trade unions, civil society or NGOs’ to improve conditions. But surely if people really did care about the provenance of their £5 jumper then fashion brands would be falling over themselves to talk about their ethics? It’s commonplace in the food industry, and not just at the Waitrose ‘free to fly’ quail eggs end of the market either. Sainsbury’s only sells free range eggs, as does McDonald’s UK, which proudly trumpets its 100% British and Irish beef burgers. That could be because people are more concerned about the livelihoods of the animals they eat than about the people that make their clothes. A Mintel study found that 74% of UK consumer said animal welfare was among the top factors that make a food company ethical, compared to just 57% for looking after their workers. But it’s also because in the food industry, ethics are seen as a signifier of higher standards. While ‘ethical food’ may conjure up images of wholesome, ruddy-faced farmers who nurture their animals like a doting parent, ‘ethical clothing’ is more likely to inspire thoughts of hessian, hippies and hemp. That's not a particularly fair perception - there are plenty of small fashion brands that make ethically sourced clothes that are comfortable and cool. And many mainstream brands, including Primark, have taken real steps to ensure their supply chain is transparent and responsible. But you won't often find them shouting about it, and you'd be fairly hard-pressed to find a 'responsibly sourced' sticker among most high street chains' clothing racks (with the notable exception of H&M) akin to the Fair Trade, Red Tractor and Soil Association logos that plaster supermarkets. The onus is on conscientious people within big fashion companies to show that dressing ethically needn't mean wearing a hair shirt.